ARCADIA, Calif. (March 16,2017)–Originally second, beaten a neck, Betty Draper was moved up to first via a stewards’ inquiry in Thursday’s $56,000 Santa Anita allowance feature, which was for older fillies and mares at 6 ½ furlongs down the hillside turf course. Ridden by Santiago Gonzalez and trained by Jim Cassidy, Betty Draper, in her U.S. debut, finished a neck off of Anita Partner’s final time of 1:13.23. With both Anita Partner, who was ridden by Tyler Baze and Betty Draper rallying furiously from off the pace while wide-out, Anita Partner came out and initiated contact with Betty Draper a sixteenth of a mile from home, resulting in a “majority” DQ from the stewards, a three-person panel consisting of Grant Baker, Scott Chaney and Kim Sawyer. Idle since breaking her maiden in France on Oct. 16, Betty Draper was dispatched at 14-1 in a field of 11 and paid $30.60, $14.00 and $6.60. Owned by Deron Pearson’s DP Racing, Betty Draper, a 4-year-old Kentucky-bred daughter of Street Cry, picked up her second win from five lifetime starts and with the winner’s share of $33,600, increased her earnings to $56,971. Trained by Jeff Mullins, Irish-bred Anita Partner out-finished Betty Draper in a head and head duel and would’ve provided Baze with his fourth win on the day. Placed second as a result of the DQ, Anita Partner, who was off at 14-1, paid $8.40 and $4.00. In addition to the disqualification of the original winner, Candy Boss, the original third place finisher, who led from the opening bell under apprentice Evin Roman was disqualified in a unanimous decision and placed fourth for interference in deep stretch. Sent from the rail, Candy Boss opened up a sizeable lead approaching the sixteenth pole, but drifted out badly, bumping and impeding the original third place finisher, Longstocking, who was ridden by Flavien Prat. 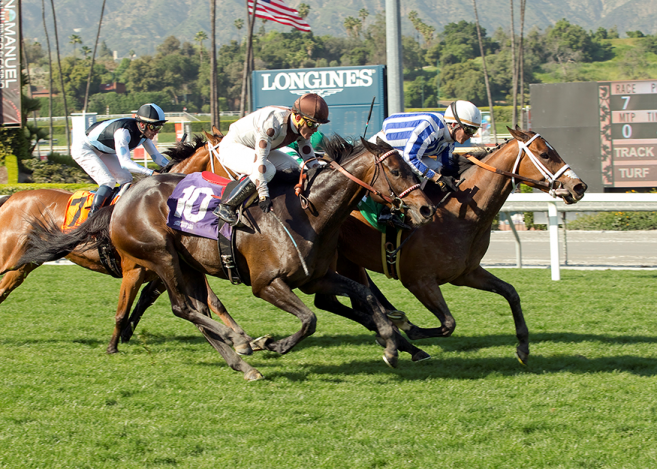 Separated by a half length at the wire, Longstocking was placed third, above Candy Boss. Off at 5-2, Longstocking paid $3.20 to show. Fractions on the race, all set by Candy Boss, were 21.50, 43.69 and 1:07.15. First post time for an eight-race card on Friday is at 1 p.m. Admission gates open at 11 a.m. For scratches, changes and complete morning line information, please visit santaanita.com.